Serious Stages designed a bespoke screen support for the main stage at Wireless, July 2018. 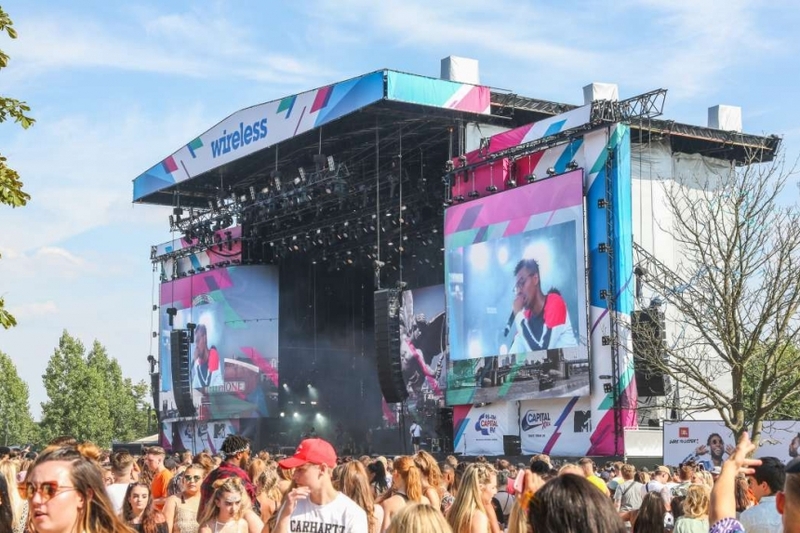 Wireless Festival attracts hoards of urban music fans to London's Finsbury Park for three days in July. Headliners this year included J Cole, Stormzy and Drake. Serious called in experienced project manager John Clarke, who coordinated the stage logistics including the installation of the 25 metre TZ stage with custom curved screen beam supports. The curved screens were a specific request from Serious’ client Festival Republic who commissioned the screen support design. This was created by Serious made at their head office site in Somerset. The curved beam support was installed to create a continuous hanging beam from the 7m wide goalpost on to the stage roof and running upstage inside the roof leg. A new front of house structure was also used for the second time at Wireless which is a new unique, four level structure with a totally clear span view. This included a spot tower, control platforms and camera platforms. Additionally, extensive AVP platforms were present across the site. Serious also provided a 25 metre x 2.4 metre front of stage thrust for Stormzy which was built after the initial day of the festival on Friday and removed after his show on Saturday.